With the growth of the market, there is a need to better understand the terms used to describe the many services, needs and practices related to this segment of travellers. This book is the first attempt at collecting all the relevant terms in one place. Understanding these concepts, terms and definitions will help destinations and services to better navigate the segment. The glossary includes travel-specific terminology used to define the Muslim/Halal travel market segment. It also covers some of the terms related to an overview of Islam, core values and practices as well as the terms used in the cultural context of Muslim lifestyle related to travel. Faith is increasingly influencing the purchasing decisions of Muslim consumers. As such, a better understanding of the terms used such as Halal, wudhu etc. is needed to properly serve this segment. This book also covers some of the faith-related terms used to describe the needs and practices of Muslim travellers. In demonstrating an awareness of the specific requirements of Muslim tourists, this growing market will be assured of the proficiency of destinations to cater to their needs. The objective of this edition of the book is to provide brief overviews of the terms to help the travel industry. As such, the terms are explained in the context of the travel and tourism sector. This book is not intended to be a comprehensive explanation of Islamic terms. Given that many terms currently used to define the Muslim travel market are new and do not have universally understood definitions, this book provides CrescentRating’s opinion and suggestion for such terms to be used. Sometimes multiple words are used to refer to the same concept, as they act as synonyms or because there are varying popular spellings of the same word i.e. wudu/wudhu and Salah/Salat etc. Only the singular is stated but if the plural is also a common word then it is placed in brackets preceded with pl. to indicate “plural”. In addition, an Arabic word may be used early in the document without explaining its meaning but you will find it defined later as part of the glossary. CrescentRating aims to keep updating this book at regular intervals to keep up with the evolution of this market. The Arabic term for permissible. In Islamic terms, it means permissible according to the rules of Islam. It is most frequently referred to in regards to food, but it includes any type of action permissible in Islam. This refers to anything considered unlawful under Islamic teachings. It is often used in conjunction with Halal, often in regards to food, but can also refer to other unlawful acts in Islam such as stealing, corruption etc. The literal translation is good/clean/wholesome. It is commonly used by Muslims to refer to food, but often that of a higher quality or purity, such as organic or even simply healthy food. Thus, food can be Halal (made of permissible ingredients) but not Tayyib. Muslim travellers: Muslims who travel. Halal-conscious traveller: Muslim travellers who do not wish to compromise their faith-based needs while travelling. The level of adherence to faith based needs may vary from one traveller to another. As such, this term refers to Muslim travellers who are looking for at least some form of a faith-based need while travelling. The vast majority of Muslims will at the very least look for Halal food while travelling. With Muslims travelling for leisure and business emerging as one of the fastest growing segments in the travel industry, the above terms are being used to refer to this segment. However none of them have a universally understood definition. Muslim travel : Muslims travelling for any purpose. Muslim tourism : Muslims travelling for tourism. Halal travel :Muslims travellers, who do not wish to compromise their faith based needs while travelling for a purpose, which is permissible. or it can also be defined as Halal conscious travellers, travelling for any purpose, which is Halal (permissible). Halal travel is a subset of Muslim travel. However, since the vast majority of Muslims will at least have some form of a faith-based need while travelling, the majority of Muslim travel will fall into the category of Halal travel. Halal tourism : Halal travel undertaken for tourism. Halal tourism is a subset of Halal travel. Islamic travel : Muslims travelling mainly for religious reasons and/or to visit Islamic religious sites. Islamic travel is a subset of Halal travel. Hajj & Umrah travel : Muslims travelling for performing Hajj or Umrah Hajj & Umrah travel is a subset of Islamic travel. It should be noted that Hajj & Umrah travel make up most of Islamic travel. Destinations that provide services and facilities that cater to at least some of the faith-based needs of Muslim visitors to the destinations. Muslim friendly destination is a more appropriate term to refer to destinations catering to the needs of the Muslim travellers. MasterCard-CrescentRating Global Muslim Travel Index (GMTI) provides ranking and benchmarking of destinations based on the services and the facilities they provide for Muslim travellers. Refer page 28 for more details on GMTI. A leisure trip undertaken by Halal-conscious travellers. Refer to the CrescentRating's Tour package rating for more information on how it rates tour packages/itineraries. These terms are currently used to refer to services and facilities such as airports, airlines, hotels, attractions and other hospitality facilities, which cater to faith-based needs of Muslim travellers at varying degrees. Muslim friendly facility/service: Service or the facility has taken into account some faith based needs of Muslim travellers but not all their needs. Although Halal-friendly facility/service may also convey the same meaning, the term Muslim friendly service/facility is more appropriate. Halal service/facility: A service or a facility which caters to all the key needs of Muslim travellers. Shariah-compliant services/facility: The service or the facility not only caters to all the key needs of the Muslim travellers, but also strictly adheres to many other Islamic requirements. This includes adhering to company governance and operations, which take into account various Islamic requirements such as halal non-interest based financing etc. In order to better benchmark the services offered by these entities, CrescentRating has developed a rating system. 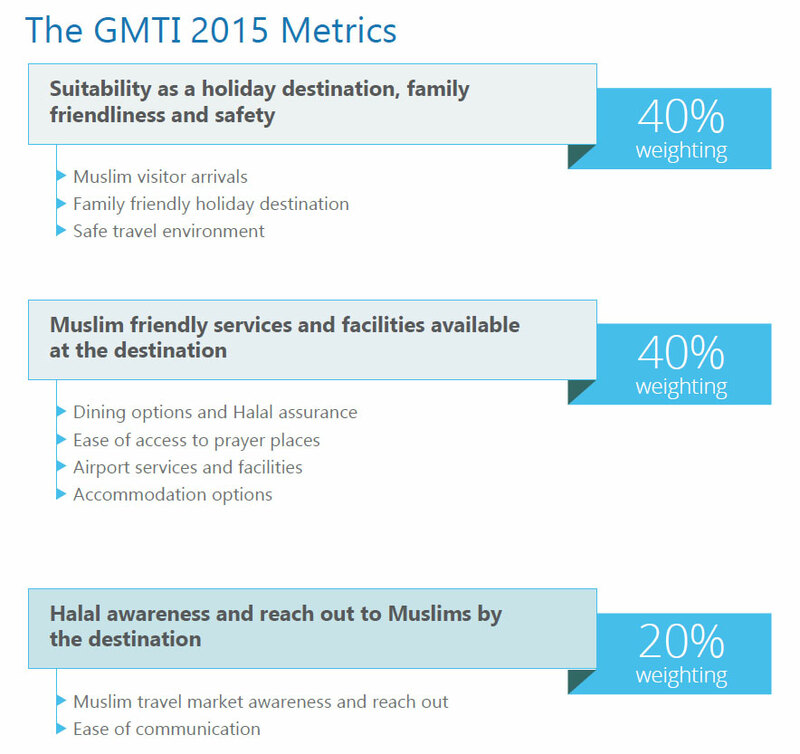 See CrescentRating’s rating systems to understand how it rates the “Muslim friendliness” of different facilities. All these terms refer to hotels which provide varying degrees of services and facilities to cater to the needs of the Muslim guests. These services range from providing information on nearby services to actually having them in the hotel itself. Some of the main features of these hotels include services such as Halal food, prayer information and facilities, prayer/qiblah directions, the ability to cater during non-standard hours in the month of Fasting, water-friendly washrooms etc. The term Shariah-compliant hotel generally refers to hotels which strictly adhere to many other requirements such as being an alcohol-free premises. They may also adhere to hotel governance and operations, which take into account various Islamic requirements such as halal non-interest based financing etc. Muslim friendly Hotel: The Hotel has taken into account some faith based needs of Muslim travellers but not all their needs. Although "Halal-friendly hotel" may also convey the same meaning, the term "Muslim friendly hotel" is more appropriate. Halal Hotel: A Hotel which has taken into account all the key needs of Muslim travellers including having only Halal food & beverages in the Hotel. Shariah-compliant Hotel: A Halal Hotel, which also strictly adheres to Islamic principles in hotel governance and operations, as well as halal non-interest based financing etc. See CrescentRating’s rating systems to understand how it rates hotels based on the different facilities and services they provide. Airports which caters to some faith based needs of Muslim travellers such as having Halal food outlets and prayer spaces. Muslim friendly cruise: The cruise has taken into account some faith based needs of Muslim travellers but not all their needs. Halal Cruise: A Cruise which has taken into account all the key needs of Muslim travellers including having only halal food & beverages as well as not having casinos in the cruise. Praying five times a day is a key obligatory requirement and is one of the five pillars of Islam. It takes the form of a physical ritual denoting submission to God and includes the recitation of praises of worship, whilst consisting of standing, bowing and prostrating, all whilst facing the direction of the Qiblah. While travelling, some Muslims will combine some of the afternoon and evening prayers, which will mean that they will pray only three times that day. Each obligatory prayer session may last between 5-10 minutes. The Mosque built by Prophet Abraham and his son Prophet Ishmael (peace be upon them) in Makkah (Mecca). It is the cube-shaped building at the centre of the Grand Mosque called Al-Masjid al-Haram – a house of God within the larger complex of the Grand Mosque. Muslims all over the world face the actual Ka‘ba when they pray. The direction in which Muslims face when performing their Salah wherever they are in the world. This is the direction leading to the Ka‘ba in the Grand Mosque in Makkah in current day Saudi Arabia. Many Hotels are now placing the Qiblah direction markings in the Hotel rooms. They are generally placed on the ceiling or in the drawers in the room. Ablution or a cleansing ritual to be completed before performing Salah. It includes the washing of the hands, face, forearms, forehead, ears and feet with water. A specific area with lower than normal taps and seats which allow ease in the washing of feet, which can otherwise prove difficult in a high-up public wash-basin/sink. These are usually found in mosques and tend to accompany prayer rooms wherever they may be. Some washrooms at Airports and other public places provide special low taps to make it easy to wash one’s feet. As the socks are removed and the feet become wet, there are often drying options available such as a mat, paper towels and flannels. Muslims are able to perform their Salah on any clean part of the ground. However, the preference is to perform it in a quiet place dedicated for prayers. Whether praying in a place allocated for prayers or any other place, most Muslims will spread a “prayer mat” and pray on it, mainly to assure cleanliness of the prayer area. This is usually a piece of fabric specially made for the Muslim prayers. Some Hotels also provide prayer mats to their guests on request, whilst some provide them in their hotel room. A room designated for Muslims to perform their Salah. Basic features include prayer mats, wudhu facilities and a qiblah direction sign. Some may also include separate areas for males and females. Such places are usually found in airports, hotels and shopping malls etc. Generally found in Airports, hospitals etc. They are usually either in the transit area or in the public areas of the Airport. Some airports provide such facilities in both public and transit areas. They are intended for use by all faiths to perform prayers, meditation etc. To cater for Muslim worshippers, these rooms may also contain prayer mats, wudhu facilities, prayer timetables, copies of the Qur’an and a qiblah direction sign. The sacred Muslim house of worship dedicated to daily prayers and other religious acts. It differs from a simple prayer room in that an Imam (prayer leader) officially conducts the five daily prayers in congregation. The five obligatory daily prayers (Salah) in Islam are called Fajr (dawn), Dhuhr (afternoon), Asr (late afternoon), Maghrib (sunset), and Isha (late evening), each having specific timings according to the position of the sun throughout the day. As such, the prayer times vary depending on the time of year and location. In any given region, the local Muslim communities usually provide the information for specific timings. There are also many mobile apps, which provide prayer times for any location. A timetable, which indicates the time of Salah, usually for the upcoming month. Some hotels provide a timetable upon request for hotel guests. Knowing the prayer times on-board a flight is particularly challenging due to the continually changing time zones and position of the Sun. CrescentRating’s Air Travel Prayer Time Calculator, now available on the HalalTrip mobile app provides prayer times as well as the qiblah direction along the flight path for any flight. The first of the five obligatory daily prayers. It’s time starts at the crack of dawn, and ends at sunrise. It is called the dawn prayer and consists of two units. The second of the five obligatory daily prayers. It’s time starts at midday, when the Sun crosses the zenith, and ends a few hours later when the day starts to cool down. Thus it is called the afternoon prayer and consists of four units. The third of the five obligatory daily prayers. It’s time starts when Dhuhr ends, and it ends itself when the Sun sets on the horizon. It is thus called the late afternoon prayer and consists of four units. The fourth of the five obligatory daily prayers. It starts a few minutes after sunset and lasts until evening time i.e. once it has gone dark and the twilight has disappeared. It is known as the sunset or evening prayer and consists of three units. The fifth and final obligatory daily prayer. It starts when Maghrib ends i.e. once the night becomes dark and the twilight has disappeared, and it lasts all night until the dawn although it is preferred to be completed by midnight. It is called the late evening or night prayer and consists of four units. The congregational prayer performed in a Mosque every Friday in place of the Dhuhr prayer. This is considered obligatory for all adult Muslim males to participate. Jumu’ah prayers consist of a sermon delivered by the Imam and then followed by the ritual prayer. The sermon and prayer may last between 30-60 minutes. This prayer is not considered obligatory for travellers. Some Muslims while travelling will avail themselves the permission to shorten and even combine their obligatory prayers for the sake of convenience. Thus, the Dhuhr and Asr prayers are halved and can be prayed at the same time, and the Maghrib and Isha prayers can be prayed at the same time too, effectively reducing the prayer times for that day to three occasions making it easier for someone negotiating the difficulties of travel. The public call to Salah which is delivered from a Mosque. It is recited aloud five times a day to announce the prayer timings of the five obligatory prayers. It praises Allah – God Almighty -and requests Muslims to gather for Salah. In some mosques, specially when they are located in predominantly Muslim communities, the Athan is transmitted via a public address system. The second call to Salah given after the Adhan, recited just before the start of the congregational prayer. This is performed in every single Mosque and prayer room all over the world. The specific sermon delivered by the Imam before the Friday Prayers. The authoritative person who leads the congregational Salah and teaches the masses their religion. The person who gives the Adhan for Salah, often in a loud, melodious and beautiful way. Food that is permissible to eat according to the teachings of Islam. This is essentially any food that does not fall into the category of Haram (or forbidden). Although some specific teachings vary, the consensus is that food/drinks must be free of pork, alcohol/intoxicants, poisons, harmful ingredients or unhygienic elements. Any meat must be slaughtered in accordance with the methods prescribed under Islamic law known as Zabihah. The Islamic method of slaughtering an animal. Muslims consider this to be the most humane and purest way to slaughter an animal for consumption. There are minor differences on which animals are considered Halal, but the general consensus is that all seafood is Halal and that herbivorous land animals are Halal provided they have been slaughtered according to Islamic rulings. This is when the owners/managers of an establishment assure the customers on their own authority that the food they serve is Halal. Many businesses around the world have seen the rising demand from Muslims for independent verification of Halal assurance of their products. Halal certification bodies perform this task of systematically verifying that products or establishments (restaurants) are in accordance with Halal requirements. Halal certification bodies are generally local bodies performing certifications within a local region/country and are sometimes regulated by government authorities. The products or establishments which have been checked by a recognised official Halal certification body and then had a certificate issued confirming its Halal status. Restaurants that are issued certificates by a Halal certification body that confirms their food as being Halal. A kitchen which is exclusively used for the cooking of Halal foods only. It maintains complete separation of Halal and Haram foods ensuring no cross contamination. Some Halal certification bodies will certify a kitchen within a restaurant independent from the overall restaurant. A logo that is labelled on Halal-certified products by certification authorities to confirm that a product is prepared according to Islamic standards. These terms are used in some cases by restaurants to indicate that the food is suitable for Muslims to consume. There is a lot of ambiguity with these terms. They tend to suggest the food is only “friendly” to Muslims and may not actually be Halal. For Muslims the food is either Halal or not. Removing pork but presenting lamb which is not Zabihah, is not Halal. CrescentRating’s restaurant rating system rates restaurants based on their level of Halal compliance. It is a Muslim etiquette to use water for cleaning one’s private parts after using the toilet. There are a number of fittings used in toilets to cater for that need. A plumbing fixture that is a small handheld shower for cleansing oneself after toilet use, usually placed in a holder against a wall near and within reach of the toilet. Increasingly popular in countries worldwide, it is widely used in Muslim countries as well as in South and South East Asian countries. A jug or bottle which is found by the toilet and is used to pour water and to clean oneself after using the toilet. Muslims are encouraged to sit down when urinating so as to keep the clothing clean, which is vital for maintaining purity as one prepares for prayer afterwards. A low sink or plumbing fixture used for washing oneself after using the toilet. The type of bidet that resembles a small bathtub is found mainly in southern Europe. In Japan, most toilets include an inbuilt bidet (commonly called a washlet) that sprays water for cleansing. These are also used in other countries such as Taiwan and Korea. Ramadan is the month of fasting for Muslims. It is also the 9th month of the Islamic Calendar. The Islamic calendar is based on the lunar system, thus it has a 12 month cycle, revolving around 355 days. As this is 10 days less than the Gregorian calendar, the Islamic months, including the month of Ramadan, vary each year in comparison. Yearly, the month of Ramadan advances by 10 days compared to the Gregorian calendar. Fasting during the month of Ramadan is one of the five pillars of Islam. It is a compulsory form of worship for all Muslim adults although there are exemptions for the ill and weak. Muslims do not have to fast while travelling, although most Muslim travellers nowadays opt to fast anyway due to the comfortable facilities available while travelling. Fasting, in the Islamic sense, requires one to abstain from eating, drinking, smoking, and intimacy from dawn to dusk. While fasting, Muslims will continue with their normal day-to-day activities; however, they will also allocate additional time and effort towards other religious activities such as reciting the Qur’an, frequenting the Mosque for extra prayers, increasing their charitable work etc. The fasting period begins at dawn and ends promptly at dusk - it is calculated very precisely based on the time of sunrise and sunset if physical observation is not possible. These times vary, depending mainly on the geographical location and the day of the year (lunar year). The time to commence fasting coincides with the time of the first of the five daily prayers a Muslim has to perform, referred to as the Fajr prayer. The conclusion of the fasting period of that day corresponds with the 4th of the five daily prayers, called Maghrib. The morning meal taken before the beginning of the fasting period is called Suhoor. This is a very important meal for Muslims. It is best to take Suhoor as close as possible to the start of the fasting period. The name given to the meal by which Muslims break their fast, at the Maghrib prayer time. At the time of Iftar, dates and water are generally consumed to break the fast. The fruit of the date palm tree that is very commonly grown in the Middle East. It can be eaten fresh or dried, and is commonly sold dried as it has a better shelf life. Dates are a significant part of Islamic tradition, and are usually used to break the fast with during the month of Ramadan. During the month of Ramadan, most Muslims will also pray an additional congregational prayer called the Taraweeh prayer. The timing of the Taraweeh prayer is after the last of the five prayers of the day, known as the Isha prayer. A religious ritual pilgrimage to Makkah that is to be performed at a specific time of the year (on the 8th to the 12th of the month of Dhul-Hijjah in the Islamic calendar). As one of the five pillars of Islam, it is considered obligatory upon every Muslim who is physically and financially capable, to perform it at least once in their lifetime. A smaller religious ritual pilgrimage to Makkah similar to Hajj, however it is optional and can be performed at any time during the year except during the Hajj days. It should be noted that Umrah trips make up the largest percentage of the Islamic Travel Industry, and that both Hajj and Umrah require specific visas issued by the Saudi Arabian government. The Islamic calendar is a lunar calendar that is based on cycles of the lunar (moon) phases. The calendar starts with the date Prophet Muhammad (peace be upon him) emigrated from Makkah to Madinah, an event known as the Hijrah in the year 622 CE. This calendar is sometimes referred to as the Muslim calendar, Arabian calendar, Qamari calendar or most commonly, the Hijri calendar; denoted by the AH sign, similar to how Common Era is denoted by CE. One of the two main religious festivals in Islam. It is a moment of great joy and celebration. The day starts with a special prayer and sermon conducted in the Mosque. It is called the Festival of Fitr which means to break one’s fast - Muslims are not allowed to fast on this day because it marks and celebrates the end of Ramadan. One of the two main religious festivals in Islam. This day honours the Prophet Abraham’s devotion to God in the story of the sacrifice involving his son Ishmael (peace be upon them). There is a special prayer and sermon conducted in Mosque. This festival last for four joyous days of great feasting and charity, starting on the tenth day of Dhul-Hijjah (the 12th month of the Islamic calendar). The parts of the body which needs be covered. Islam provides guidelines for Muslim males and females regarding modesty in dress. They differ for males and females, depending on their age, and depending on whom they are in the company of. The head scarf worn by Muslim women in public places which covers the head, ears, neck and chest. An additional cloth worn by some Muslim females to cover the head and some parts of the face. A loose over-dress that extends to the feet. A long robe worn by Muslim men, specifically in Arab countries. The top is usually tailored like a shirt, but it is ankle-length and loose. “Peace be upon you!” said when a person greets another. “Peace be upon you too!” said when a person responds to the greeting of “Assalamu alaikum”. “May God reward you with good!” said to thank someone in return when a person has done some good for you. “God Willing” said when a person intends to do something. “It is as God Wills!” said when appreciating something. “All praise and thanks are due to God” said when one hears good news or is feeling grateful. “A Blessed Eid to you!” a greeting offered to one another during the two Eid festivals. The name in Arabic used to refer to God Almighty. Muslims believe Allah is the One True God, the Almighty, the Omnipotent, the Creator of the Universe and the Judge of Mankind. A monotheistic religion/faith that is defined primarily by the belief in submission to the One True God alone, and in accepting Muhammad (peace be upon him) as the final prophet of God. Individuals who subscribe to the religion of Islam. The way of life prescribed by Islamic teachings. This includes a wide range of aspects such as financial and economic matters, as well as everyday matters from hygiene and manners, to charity and worship. 1.Shahadah – to declare in one’s heart and upon one’s tongue that there is nothing worthy of worship except God, and that Muhammad is His Messenger. 2.Salah – the five daily obligatory prayers. 3.Zakah – to give 2.5% of one’s excess wealth to charity every year. 4.Siyam – to fast the month of Ramadan. 5.Hajj – to perform the pilgrimage to Mecca at least once in one’s lifetime, if capable. A religious scripture, believed by Muslims to be the exact Spoken Word of God and the final revelation and last testament to mankind through the last prophet, Muhammad (peace be upon him). Its script is in Arabic and it is meant to serve as a guide to humanity. Its translation is now available in most global languages. The way of life a Muslim is to follow, based on the statements and actions of the Prophet Muhammad (peace be upon him). After the Qur’an, it is the second most authenticated source establishing all Islamic law and Shariah norms. It is an obligatory charity or alms-tax taken from those Muslims who have sufficient wealth. It corresponds to 2.5% taken from their excess wealth and is given to the poor and needy once every year in accordance with the instructions of Islamic law. The individual act of supplication to God Almighty. It can be done quietly or aloud, and is an encouraged act of worship. A proprietary rating system developed by CrescentRating to rate travel services on how Muslim-friendly they are. A hotel granted a Crescent Rating from 1 to 7 based on its Halal food facilities, prayer facilities, services during Ramadan, level of non-Halal activities and recreational facilities in the hotel. A restaurant with a Crescent Rating of AAA, AA, A, B or C. The rating is mainly based on how the food served is assured Halal (whether certified by a local body, self assurance etc.) and whether or not it serves alcohol. A spa or wellness centre which has been granted a Crescent Rating. Spas that have been Crescent Rated indicate that they are capable of catering to Muslims, with its rating showing the extent of its Muslim-friendly services and facilities. Various factors and criteria are taken into consideration when awarding a spa a Muslim-friendly rating. A tour package with a Crescent Rating of Bronze, Silver, Gold or Platinum. Its rating is based on the inclusion of Halal food services, prayer facilities, the Halal-friendliness of the accommodation, the inclusion of a Muslim community connect program, and the involvement of tour guides or drivers accredited by CrescentRating. A licensed tour operator, accredited as a partner of CrescentRating, who has a thorough understanding of the needs of Muslim travellers and is able to provide tour packages which cater to the needs of Muslim travellers. A licensed travel agent, accredited as a partner of CrescentRating, who has a thorough understanding of the needs of Muslim travellers and is able to provide tour packages which cater to the needs of Muslim travellers. Muslim Community Connect is a program designed by CrescentRating to be included in tour packages, whereby Muslim travellers are given a unique opportunity to explore the diverse lifestyles of local Muslim communities in the destinations they travel to. CrescentRating’s proprietary reference model is used to identify individual segments in the travel services value chain. The model allows a destination to identify the gaps, thus being a precursor to strategy development. CRaHFT model can be applied to any type of tourism. (Leisure, Business, Healthcare & Education, MICE and live events). CRaHFT model analyses the services offered from the time a traveller leaves his home, to airports, food & beverages, transportation, hotels & hospitality, shopping and tourist attractions. The MasterCard-CrescentRating Global Muslim Travel Index (GMTI) looks at nine criteria to rank destinations for the Muslim travel market. The Organization of Islamic Cooperation. It brings together 57 states/countries. 82% of the total population of these countries is Muslim and this constitutes approximately 80% of the global Muslim population. These countries are sometimes also referred as Islamic countries or Muslim countries. All countries that are not a part of the Organization of Islamic Cooperation, no matter the size of their Muslim population. The holiest city of Islam, located in modern day Saudi Arabia. Prophet Muhammad (peace be upon him) was born in Makkah. Muslims believe Prophet Abraham and his son Prophet Ishmael (peace be upon them) rebuilt the first mosque on earth there known as the Ka‘ba, after the original mosque was built there by the Prophet Adam (peace be upon him). Muslims perform their five daily prayers facing the Qiblah direction to the Ka‘ba, from wherever they are in the world. It is also the place where Muslims go to perform the Hajj pilgrimage. The second holiest city in Islam located approximately 450km from Makkah. This is the city the Prophet Muhammad (peace be upon him) spent his life after emigrating from Makkah. It is home to the Prophet’s Mosque which is the second most visited Mosque in the world. The third holiest city in Islam, and the site of the Aqsa Mosque which was the location that Muslims believe Prophet Muhammad (peace be upon him) led all the other prophets in prayer, and ascended to meet God Almighty in what is known as the Ascension. No part of this publication may be reproduced without prior written approval from CrescentRating Pte. Ltd.